If you’ve ever tried to stir fry a pack of bean sprouts in a frying pan, you’ll probably understand the tribulations of trying to keep every single bean confined as you stir. Cue a mess all over your shiny, clean hob and a military-like clean up operation. This can all be avoided, though, by using a wok. And of course, there’s more to using a wok other than the convenience of its size. The material of your wok can make a great difference to its usability. Chinese chefs won’t have anything other than a carbon steel wok in their kitchen, because of its ability to spread heat evenly across its surface; it means ingredients cook evenly, no matter where they are placed in the pan. Aluminium and stainless steel are also equally as credible materials, and if you like to keep your recipes relatively oil-free, you should look out for a non-stick wok to avoid half your evening meal sticking to the pan. Many woks need seasoning before they are used. Seasoning helps the wok to develop its own non-stick properties, and usually involves heating the wok to a high temperature, cooling, wiping with oil and putting it back on a low to medium heat until it stops smoking. Each wok will come with its own instructions, so you don’t need to worry, and some may not need to be seasoned all. Traditionally, Chinese woks came with two metal handles. These days, certainly for flat bottomed woks, a long handle is commonly on one side, which helps you to keep the wok steady when you’re stirring the contents, and a smaller handle is on the other side, which helps you to transfer the wok to your serving area once cooking is complete. Finally, a wok isn’t just for stir-frying. Chinese recipes make a great alternative to the stereotypical British approach of meat and two veg, and often you have to simmer or cover during the cooking process. If you’re looking to consult your shelf of recipe books, perhaps consider a wok with a lid, as it will give you a greater variation to the type of recipes you can cook. We’ve come up with a varied list featuring the best woks on the market. Whether you’re looking for one affiliated with a famous chef, or you’re simply looking for a budget buy, we have you covered. This traditional Chinese wok endorsed by celebrated chef Ken Hom is the perfect choice if you’re looking to break into authentic Asian and Chinese cooking. Once it has been seasoned, it should give you a non-stick cooking experience. Known for its strong heat conducting properties, you’ll find an even heat across the entire carbon steel pan, so all your ingredients should cook equally. Reviewers find it’s the perfect size for cooking for two, while some find it hard to effectively season if using an electric hob. If seasoning isn’t completed correctly, ingredients may still stick to the pan, so to save yourself the hassle, this wok comes with a titanium non-stick coating which doesn’t require any pre-treatment. Made by Tefal and endorsed by Jamie Oliver, there’s enough signs to say this wok is a good one, just bear in mind that you’re paying a bit more for it. For convenience purposes, this wok is dishwasher safe, giving it an edge over our previous pick, which can only be wiped clean. Reviewers are commendable of the quality and the cooking experience this wok delivers, so this one is probably a solid purchase. Due to its flat base and heat transfer properties, this wok is great for induction hobs. Just as credible as our first pick, this Ken Hom pan comes with a lid so you can prepare far more dishes with it, Chinese or otherwise. Made from stainless steel, it has been manufactured to ensure heat is spread easily, while the phenolic handles, metal in appearance, don’t conduct heat. The pan comes with a non-stick layer, avoiding the need to season it, but while instructions say the layer is strong enough to cope with metal utensils, many reviewers find that it will wear off, so it’s best used with wooden or soft alternatives. If you like to choose your kitchen utensils from a style perspective, thanks to the external enamel of this wok, you can purchase it in either gloss black or cream in line with your existing kitchen design. Featuring a honeycomb non-stick base, there’s no need to put lots of oil in the pan, as food can be cooked evenly without it - great if you champion healthy eating. With its tempered glass lid, you can use this wok to cook all manner of dishes, whether it’s a curry for the entire family or a simple stir fry. Many recipes involve sealing meat and pan frying ingredients as part of the preparation. After that, it’s about cooking it up slowly and on a low heat to tenderise and release the full potential of the flavour. This wok is perfect for combined cooking, so there’s no need to swap pans and create more washing up. With its bright red exterior, it’s great for themed kitchens, while the non-stick interior keeps it completely practical. Because the lid isn’t glass, it may be a fiddle to assess the stage of your meal simply through the oven window, but a small price to pay for a wok that is both cost-effective and built with quality in mind. You don’t need to spend lots of money to purchase yourself a good quality wok, as this VonShef number demonstrates. As with the pricier woks on our list, it features a non-stick coating, although it must be treated with care to ensure the longevity of it. 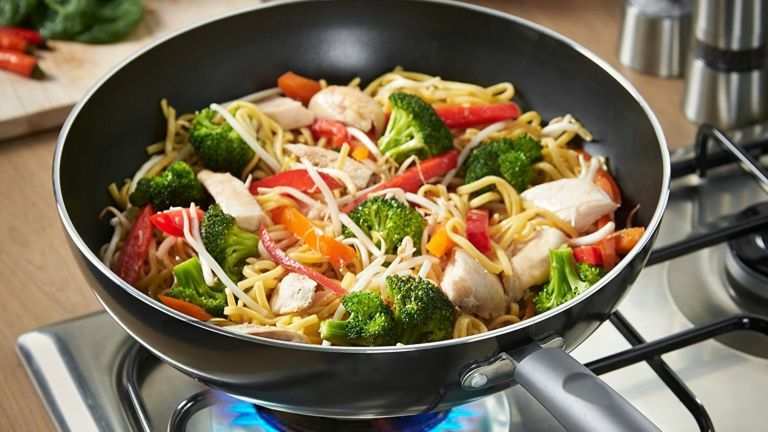 While not as large as some of the other woks on our list, it’s the perfect buy for smaller households and thanks to the long, sturdy handle, cooking up a quick stir fry shouldn’t come with any problems. Because it’s cheaper than other products on the list, you may find it doesn’t wear as well, but it does come with a 2 year warranty if you’re uncertain.